of how young monsters learn the art of scaring humans. The show began on Nickelodeon (Ren & Stimpy, Jimmy Neutron) on October 29, 1994. The focus is on three friends in The Gromble's monster school, located deep under a city dump. Krumm, who is voiced by David Eccles (who has done scattered voices in The Wild Thornberrys, The Wacky Adventures of Ronald McDonald and elsewhere) is short and dumpy, and usually carries his detached eyes in his hands. His greatest scaring weapon is the stench from his armpits. Ickis, voiced by Charles Adler (Buster Bunny in Tiny Toon Adventures), is purple and has long ears. He's sometimes mistaken for an off-color rabbit, but manages to scare by suddenly growing into a giant. Oblina, voiced by Christine Cavanaugh (Dexter in Dexter's Laboratory, Gosalyn in Darkwing Duck), is a rich kid, who looks like a broadly-striped worm. She scares people by reaching into her out-sized mouth and pulling out her internal organs. Gromble, voiced by Gregg Berger (who narrated the Wacky Races video game in 2000), is a hard taskmaster, not just ridiculing his students when they botch a scare job, but even, on occasion, eating one or two, which he demonstrated in the first episode. He's assisted by the disciplinarian, Snorch (also voiced, inarticulately in his case, by Eccles), who metes out punishments such as having to listen to human music; and the snitch, Zimbo (Tim Curry, who played Gomez in Addams Family Reunion), a bee-like monster who flits around and catches misbehaving youngsters. There was also a human character, Simon (James Belushi, also heard in Gargoyles and Pinky & the Brain), a monster hunter who was always trying to prove his quarry's existence. Aaahh! 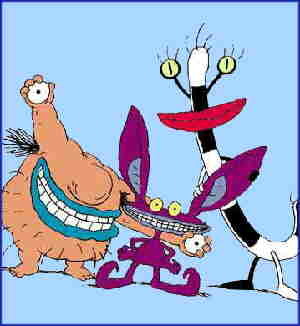 Real Monsters ran four seasons on Nickelodeon, for a total of 102 episodes. Also, there was a video game in 1995. After new episodes stopped being produced, the characters made a few guest appearances with the Rugrats, but it hasn't had much of an afterlife in reruns. Text ©2006-08 Donald D. Markstein. Art © Nickelodeon.